I bought this bow new from Gliga along with a violin a couple of months ago and I play at least two hours a day on it. Recently the little plug that retains the hair at the tip keeps popping out. I can put it back in and keep playing, but now hairs are starting to come loose. What can I do about it? Could I be doing anything to aggravate the problem? How long did you have it before the plug popped out? I'm pretty sure Gliga will exchange or fix it for you provided it's only a few months. The wooden plug is necessary to hold the hairs tightly in place and to spread the hairs at the tip. The best thing to do if they don't help you is to carve a new piece similar to that one but slightly bigger, comb the hairs to the tip, providing the knot is still intact, and carefully jam the new plug in place. If it's fitted properly, it should stay in place. I have contacted Gliga and I'm waiting for a response. I may cannibalize my Cecilio bow for the plug to see if it is tighter. So it's just wedged in, no bonding agent of any kind? No, if you put any type of glue or "sticky" goop in or on it, it will track up the hairs and most likely ruin the hairs/bow. It will also track down into the hole where the knot is. It will be a mess. Its a friction hold only. I wouldn't cannibalize another bow, as more then likely you will end up with 2 non-functioning bows. The chance that the plug will fit properly is slim. The only fix is a new plug. They are pressure fit. Don't put any kind of adhesive on it or you will ruin your bow. Each plug has to be shaped by hand for a good fit, the slot where the plug goes are not likely to be the exact same size for any two bows. Making a new plug wouldn't be too hard, but would probably take some time. Somebody has contacted me from Gliga and they tell me to superglue it back. I have responded wondering how I replace the hair if the plug is glued in. That was bad advice. I guess the only rational thing to do now is get a FM carbon fiber bow. Hmmm ... so what do I do with the old bow? I think I'll try shimming up the peg with some paper. 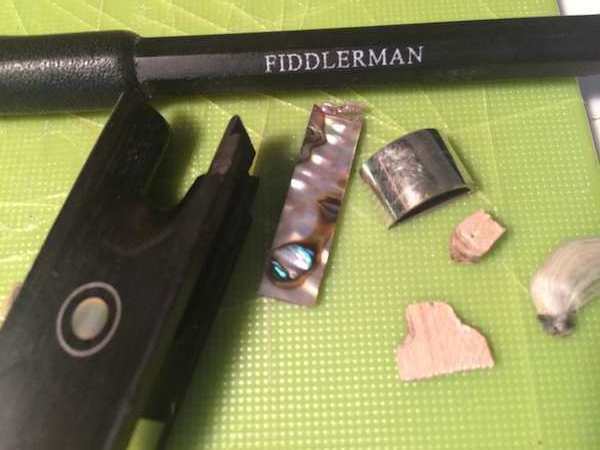 @PopFiddle, sure you could do that or you could just carve/whittle/sand a replacement piece of scrap wood that's a hair larger. All it is is just a little plug of wood that has room for the hair and fits really snuggly in the slot. The people that I've seen do it on youtube (there are a number of videos on how to rehair a bow) make it look as though it takes some pressure to snap one in. You might want to watch some of those videos. A thin shim of wood or paper would probably work well too. Many bows today use crazy glue on the wedges. You can still get the wedge out later to replace the hair. May I ask how much you paid for this bow? By the way, if I remember correctly, the FM carbon fiber bow has a glued in wedge on the tip. 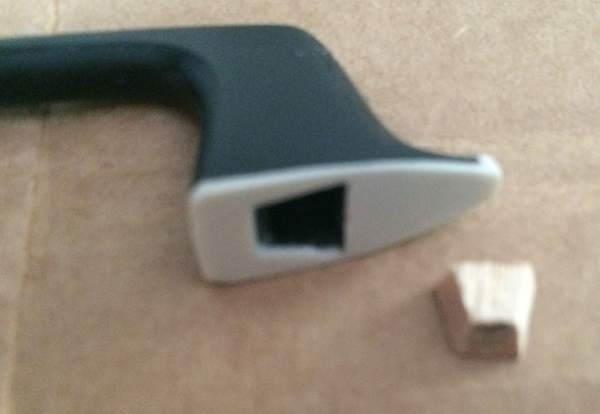 How do you remove a plug once it has been glued in? You don't. If you glue the plug in, it's going to stay in -- forever. Most likely when the hair wears out you get a new bow. That's acceptable for bows under $100, because paying somebody to rehair it would cost more than the bow. If you have a $350+ bow, then it would be a VERY bad idea IMHO and the more expensive the bow the worse the idea becomes. @PopFiddle: You can drill the plug out. Drill a hole in the center of the plug, then use a sharp X-acto knife to finish digging out the remainder of the wood. I've watched my luthier re-hair several bows and a couple where the plug was glued in both ends. Hog wash that you can't get the plug out. And "Mark" (my luthier) only charges the standard rate $45 - $50 for a re-hair. @Kevin M. I just popped one out and it wasn't glued in. As Uzi says, it's not hard to do. Start with a piece similar to what fell out but 1-2 mm's wider and longer. Try to press it in carefully with good support behind the tip of the bow and remove thin slices of wood until you get it going in. Once you find a close fit you press it in all the way. If it falls out it was too loose. OK. I stand corrected. You can dig them out with enough effort and running the risk of damaging the bow. One luthier said, that he uses a 1-10 scale of cursing when removing plugs that have been glued in, with 1 representing no cursing at all and 10 requiring repentance and acts of contrition, but he does get them out. However, they are not supposed to be glued in. Checked out the frog on our Fiddlerman Carbon Fiber bow too and it wasn't glued either. Thanks to all for showing up. At the moment, I'm just watching it, pressing on the end of the bow every once in a while to keep it in place. 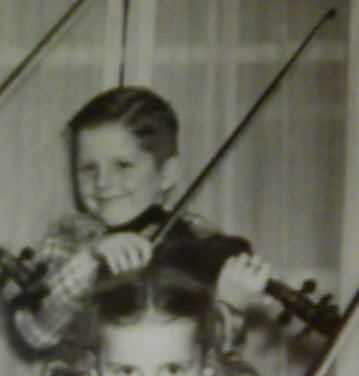 I'm a bit behind on my fiddle maintenance, I have to catch a break and sit down with it, but not for a while yet. Wow.. this has been enlightening. I have never seen a bow taken apart... and I hope I never have to experience it either. Very good stuff, thanks everyone for posting and for pics. There are times when a glued in plug is not intentional. Some people (when re-hairing a bow) will apply a couple drops of, "Super / Crazy" glue on the ends of the hairs to fuse them together, then push the plug in before the glue is dried, hence the plug being permanent. My luthier will apply the glue after the ends are wound and tied with a fine line, then touch it with a flame from a lighter to instantly dry the glue before inserting the plug back in. There's never a problem when it's done this way. I suspect that production made bows are put together in a hurry before the glue is dried. I was wrong about the Fiddlerman bows. I must have gotten it mixed up with another CF bow I rehaired. I will rehair it and get it back to you ASAP. It may take awhile since I will not be doing much until after the first week in February. Let me know how you like the shirt.